This air conditioning inspection article discusses the how to perform a simple visual inspection of an air conditioning compressor-condenser unit, including links to more detailed air conditioning inspection,diagnosis and repair articles useful in the evaluation of air conditioner compressor noises, hard starting, lost cooling capacity, and detection of a burned out compressor or A/C compressors at or near end of their life. Maintenance tips including attention to compressor support pads and avoiding air conditioning refrigerant leaks are addressed. The (usually) outdoor half of a typical air conditioning system is a unit containing the refrigerant compressor and condensing coil. The air conditioning compressor motor is a pump which draws heat laden refrigerant gas from the building's indoor components (evaporator coil and air handler), and compresses the low pressure refrigerant gas to high pressure and higher temperature. The diagnosis and repair of various defects in the air conditioning compressor/condenser unit are discussed in detail using the links provided at the end of this article . Here is a little visual inspection checklist that any homeowner or home inspector can perform. Sketch courtesy of Carson Dunlop Associates. AIR CONDITIONING & HEAT PUMP SYSTEMS describes the major components of an air conditioning system. Sketches and photographs are provided, and common defects for each A/C component are listed along with visual or other clues that may suggest a problem or probable failure of each components. We explain how an air conditioning service technician will diagnose certain common air conditioning system failures or defects. We include photographs to assist readers in recognizing cooling system defects. see REPAIR GUIDE for AIR CONDITIONERS. Is the unit too close to the property line - a possible noise issue for neighbors or a local building code violation? Most municipalities require that the compressor be at least 10' from the property line. Compressor/condenser fan damaged, loose, bent: look for evidence of damage to the fan itself (rare). 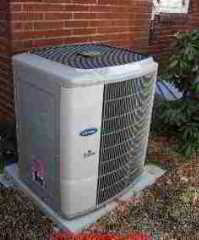 See FAN, COMPRESSOR / CONDENSER UNIT for details. Compressor motor damage or overheating: may be indicated by smells, odors, noises (humming, hard-starting) or by oil leaks. Data Plate Information for the A/C or heat pump system: is there a data plate at all? If you can find it, record the model, serial number, and other data from this tag - it can help locate service manuals, system specifications such as RLA, maximum fuse size, and it will permit you to find the age and cooling capacity of the unit. See DATA TAGS on AIR CONDITIONERS. A home inspector can be asked to make a rough comparison between the cooling capacity of the compressor and the square footage of the building it serves. see AIR CONDITIONER BTU CHART. Electrical service disconnect switch at the air conditioner compressor/condenser: a service disconnect switch, fuse, or circuit breaker should be installed, usually on the building wall close to the unit. Check the size of the fuse or circuit breakers and compare with the overcurrent protection specified on the data plate on the compressor/condenser unit body. See A/C - HEAT PUMP CONTROLS & SWITCHES. 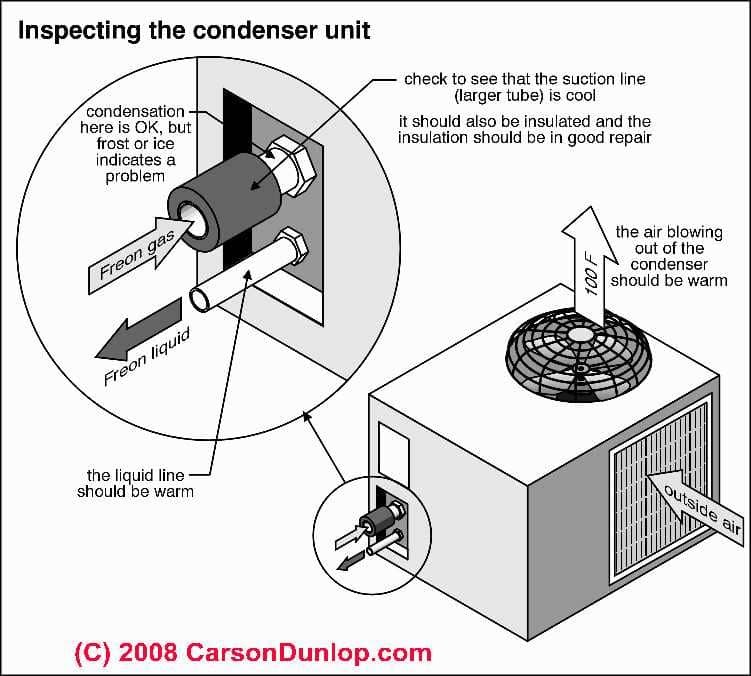 Levelness of the condenser/compressor unit: the unit should be level or within 10 deg. of level. Noises at the air conditioner: if the compressor can be run, listen to the motor and fan motor when the unit starts and after it gets running; Noisy or hard starting compressors may be at or near the end of life or may need service and repair. Refrigerant charge problems: while you cannot see the refrigerant level directly in residential and light commercial air conditioners or heat pumps, some systems provider a sight glass that can give a clue indicating low refrigerant charge: bubbles visible in a sight glass located in the compressor/condenser unit near the receiver. See REFRIGERANT SIGHT GLASS. Bubbling or gurgling sounds in the refrigerant lines can also offer a similar clue. Refreigerant piping leaks, insulation; condition of the air conditioner refrigerant lines: look for lost insulation on the suction line; look for absence of any bend or slack in the refrigerant line; if the compressor/condenser is connected to copper piping that is rigid between the unit and the building wall, vibration, settlement, slight movement can produce a refrigerant leak. Temperatures of operation: a home inspector or service technician may use other instruments, including measuring simple air temperatures at the compressor/condenser to get an idea how well the system is functioning. Wiring for the air conditioner or heat pump: inspect the wiring, fusing, overcurrent protection, circuit breakers supplying electrical power to the air conditioner compressor/condenser unit: look for signs of damage or overheating, broken conduit that should be protecting the wiring. A home inspector or electrical inspector will compare the size (current carrying capacity) of the wiring with the fuse or circuit breaker size and the size specified by the data tag. She should also check that the wiring to the compressor/condenser is rated for outdoor use or is suitably installed in conduit. See ELECTRICAL INSPECTION, DIAGNOSIS, REPAIR. at LOST COOLING CAPACITY, our focus is on the case in which the air conditioning system seems to be "running" but not enough cool air, or no cool air at all is being delivered to the occupied space. Sketch from Carson Dunlop Associates. at OPERATING DEFECTS we take you through the major air conditioning problem symptoms and how to get the air conditioning system working again. Continue reading at A/C - HEAT PUMP CRITICAL DEFECTS or select a topic from closely-related articles below, or see our complete INDEX to RELATED ARTICLES below. A/C INSPECTION CHECKLIST - OUTDOOR UNIT at InspectApedia.com - online encyclopedia of building & environmental inspection, testing, diagnosis, repair, & problem prevention advice. Question: what's inside of a hermetically-sealed compressor unit? COMPRESSOR / CONDENSER REPAIR shows what is inside of that sealed A/C compressor motor. There we include illustrations and text. A question which just came up: A large tree was recently cut back which had provided shade for my outdoor condenser which faces southwest. Will the efficiency of the unit be adversely affected by this exposure to the hot uninterrupted summer sun? Your comments will be of great help for someone who obviously is not very knowledgeable. Thanks. Shade and A/C condenser units: good question Estelle. The outdoor condenser indeed has a slightly easier time of it if located in shade, though the units are designed to be capable of functioning in full sunlight. I have not found a source that gives us actual data on the change of system efficiency when shaded. So I'm reluctant to give a "made-up" number guess. But WATCH OUT - don't put any shade over the compressor/condenser that is so close or closed as to block airflow over the unit. Most A/C compressor installation manuals will give the required clearances around all sides and above the unit in order that its airflow is not obstructed. If you can't find that information, and if your shade source is at least six feet above the unit you should be OK. I turned our A/C unit on and it is blowing hot air. I checked the outside unit and the fan is on. I was standing by it when it came on, the fan came on first, then a few seconds later I heard the compressor come on, it was humming pretty loud. The pressure line going into the unit was very warm. I checked the coils inside the house, (air handler?) and they were pretty warm also. Could this be the start up capacitor? Thanks. Question: cutoff valves on AC / heat pump refrigerant lines? Slam Jeme I haven't seen cutoff valves on refrigeration lines, but if that's what youv'e got it may be that a swap-out ability was what was intended. Just ask your tech how they are going to get all of the air out of the new system and lines during the reconnection process. Watch out: a shutoff valve on a refrigerant line can prevent proper compressor/condenser operation and may be unsafe to boot. The outdoor compressor fan is not turning even though the a/c is running. Air does not seem as strong or as cool as it usually is. Should I turn it off in order not to burn up the motor, or what are my other options? Can it be fixed? The fan on the outdoor condenser is turning, but at a slower speed. The air coming from the top of it is cool, not warm. It makes a sound like a stick being run across a grate periodically as if it's trying to kick into a higher gear. The sound lasts about 3-4 seconds. Indoor runs but air is somewhat cool. Capacitor was tested and checks out fine (it was installed last summer). We currently have it turned off. Any suggestions? Evilu if the outdoor fan is not turning but the outdoor compressor motor is trying to run it sounds like a fan relay or fan start run capacitor problem. TURN OFF the system to avoid damaging it while you wait for repair. My condenser stopped working a few months ago there was no noise of it trying to start just nothing at all. The other day I was looking at it and decided to jiggle the wires coming from the blower and the unit started right up and shut down. I jiggles the again and it started right back up. I could see the wire nuts holding the wires together and decided to reconnect them better. When doing so they came out of the wire nuts. I had a blue and yellow wire coming from the condenser. And a red and white wire coming from the blower. No matter what combination I tried I could not get the unit to work again. And now nothing is working blower, heater, or the condenser. Any suggestions? I have tried all breaker that I know of. Sounds as if in moving wires around you may have blown a fuse or mis-wired the unit. Ask for help from your heating service tech. Meanwhile leave power to the unit turned off for safety. After switching on split AC, and starting through Display unit, Display shows for 7 to 8 seconds and off for 4 to 5 seconds. A C unit dosen't work. Can any expert tell why this happening? or cause of this? If a display is cycling on and off I'd look for a condition that is causing the system to lose power itself or a loose switch, or an overload causing a system reset. What is the minimum outdoor temperature for accurate tune up/maintenance/ Freon level check? In the inspection points for A/C and heat pumps listed in the article above please see "Temperatures of Operation" where you'll find a link to a detailed article diving operating temperatures and the measurement procedures.